Photos by: Hogaboom Road, Inc.
Photo: © Hogaboom Road, Inc.
Finding the boundary between Texas and Mexico isn’t as simple as locating the Rio Grande. As I discovered on my trip to Laredo, the border between these lands is more of a gradual blending, where the best parts of Texan and Mexican traditions mix and fill the area with history, food, and pride that’s truly unique. 9 a.m. I started my day on the famous “Streets of Laredo” by walking through the San Agustín de Laredo Historic District in the heart of downtown. Unlike many Texas towns, Laredo was not built around a courthouse but a grassy plaza and the beautiful San Agustín Cathedral, established in 1760. As I walked past other buildings like Casa Ortiz, built between 1829 and ’30, I quickly realized I was standing on special soil in a place much older than Texas as we know it. 9:30 a.m. Attracted by the seven waving flags, I stopped at the Republic of the Rio Grande Museum and discovered this small sandstone and limestone structure once served as the capitol of its own nation. During the 1840s, three states in northern Mexico, which stretched north of the river at that time, declared their independence from Mexico. This new republic only lasted 11 months, but its memory lives on in this museum full of artifacts that serve as a testament to the independent border spirit. 11 a.m. Next, I crossed the street to visit a museum commemorating one of Laredo’s most beloved heroes—George Washington. The Washington’s Birthday Celebration Museum tells the story of how this Tex-Mex town embraced its American identity and now celebrates it in style during a monthlong festival in January and February. The handmade gowns worn by debutantes in the Princess Pocahontas Pageant and Society of Martha Washington Pageant and Ball featured ornate designs. While I don’t think they would fit me, I marked my calendar to return for the jalapeño-eating contest. 12:30 p.m. One of the best parts about Laredo’s blended culture is its authentic Mexican food. While Taquitos Ravi started in Nuevo Laredo 30 years ago, it has become a local favorite stateside, too. My deep-fried tripas (intestines) street tacos piled with onion, cilantro, lime, and salsa were some of the best I’ve ever had. So good I had no choice but to eat five. 1:30 p.m. To walk off my lunch, I headed to San Bernardo Avenue where Mexican import shops line a few blocks of the street by the dozens. Brightly colored goods filled the stores—from bold blue sombreros and multicolored dresses to giant terracotta pots and pink flamingo lawn ornaments. I spent the most time at Basket & Pottery Alley, where I was tempted to buy a pink mariachi suit. I decided to save the cash for my taco budget instead. 4 p.m. Ready for some outdoor adventure, I pointed my GPS toward Lake Casa Blanca International State Park. I set out on the Roadrunner Trail and found myself hiking alongside cactus and brush. However, it wasn’t too long before my eyes caught a flash of color as a group of green jays crossed the trail. In warmer weather, I would have gone for a swim, but I contented myself by hiking around the lake and breathing in the fresh air instead. 6 p.m. Hungry for dinner and something beyond the norm, I headed to Las Kekas, which serves up Chef Nicolas Bellizzia’s favorite dishes inspired by his travels around Mexico. I started with a plate of kekas, savory pastries similar to empanadas that are stuffed with every-thing from marinated pork to huitlacoche (corn fungus). The flavors were both familiar and foreign, making for an all-out fiesta in my mouth. I finished them in no time and ordered a second round full of shrimp and cactus. Qué bueno! 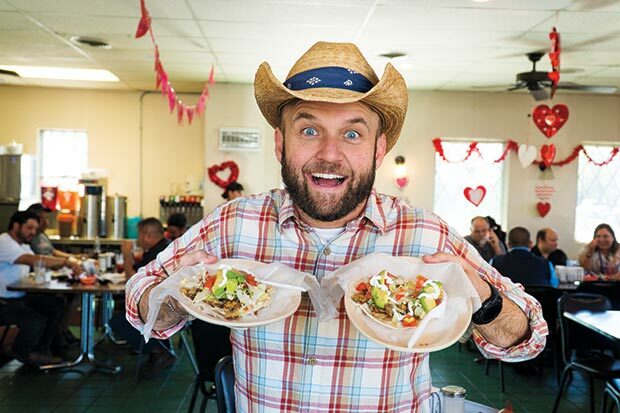 While Laredo is firmly within the border of Texas, travelers to this region know this blend of language, cuisine, and adventures can only be found here. Whether you follow my footsteps or forge your own path, I hope to see you on the road. Contact the Laredo Convention and Visitors Bureau at 956-795-2200. Chet Garner is the host of The Daytripper® travel show on PBS.